Getting a home contractor you can trust is not always easy. More importantly, determining the cost of home repairs and other projects before contacting a professional is almost impossible. For those who want to have some work done on their home, it usually means navigating the local yellow pages or reviews sites like Yelp that don’t specialize in home service professionals to find one whose schedule and price fit their needs. A new marketplace for home service professionals called Pro.com seeks to reduce the pain associated with hiring someone, by providing price transparency around the jobs that need to be done while also connecting customers directly with qualified, highly rated contractors. The company was founded by Matt Williams, who served as CEO of Digg before the company was sold in 2012 to Betaworks and LinkedIn and The Washington Post. But before that, he worked for about a dozen years at Amazon, where he worked on the company’s marketplace, community, wish list, registries, and consumer payments products. To get started, users simply enter a home to-do list into its platform, along with their zip code. With that information, Pro.com offers up an instant, real-time estimate of how much the work will cost based on the customer’s location and available contractors nearby. It’s established these estimates using a number of different sources of information around the web. And it’s created a database of nearly 2 million professionals around the country. 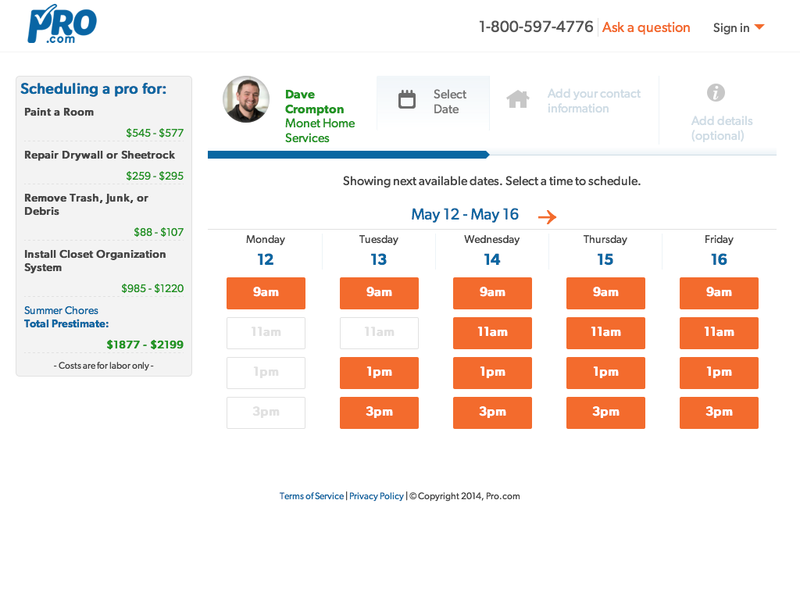 In some areas, like its home base of Seattle, Pro.com offers the extra step of enabling customers to directly book a home service professional through the platform, without having to make a phone call. The platform determines the best professional for a certain job based by looking at location, expertise, and ratings of each, and it assigns a ranking based on that information. Once that’s done, users can simply choose a spot in a professional’s calendar that works for them. All contractors have been pre-vetted by Pro.com, which does background checks and also reviews references by surveying former clients about the work that was done for them. And once they’re on the platform, the company gets verified ratings by customers who directly booked on its website. Launched as SeattleHomePro last year, the company is rebranding and offering up its real-time estimates — which it calls “prestimates” for some reason — to users throughout the country. In places where it doesn’t yet have direct booking available, users can request a list of qualified professionals be emailed to them. Of course, going national is a tall order, and you can bet that Pro.com has a lot of work ahead to sign up contractors in all the various locales around the U.S. where people need work done in their homes. It’s got a sales force that is looking to make home service professionals available for direct booking, and it will likely be targeting places where it receives the most requests first. It’s incentivized to do so, since the platform makes money not off listings, but on a commission basis from professionals who have been booked using its platform. Of course, home repairs and local services are a huge market — but they’re also a tough nut to crack. To tackle that opportunity, Pro.com had raised $3.5 million in seed funding prior to launch from investors that include Madrona Ventures, Andreessen Horowitz, Redpoint, Bezos Expeditions, Two-Sigma Ventures, and Sherpa Foundry.